A maximum of 30 hours can be excluded from the GPA. Courses and grades approved for Academic Renewal remain on the transcript but are excluded from the GPA calculation(s). Academic Renewal applies to D and F grades only. In order to apply for Academic Renewal, students must wait a minimum of two (2) academic years from the last term being considered for Academic Renewal. Students must be enrolled and have completed at least six (6) credit hours in a single semester with a 2.0 term GPA in that semester to be awarded Academic Renewal. Students can only apply for Academic Renewal once, and it is not reversible. To request Academic Renewal, students who meet the criteria must meet with an Advisor and submit the completed Academic Renewal Request form (available online at www.arapahoe.edu/admissions/forms). Academic Standing applies to all students who have completed 9 or more credits at ACC, regardless of the number of term credits they attempt from that point forward. ACC will determine Academic Standing following the posting of the majority of term grades for each semester. Students placed on probation or suspended will be notified of their status. Suspended students will not be allowed to attend any CCCS college in the subsequent semester/s unless an appeal is approved. Academic Standing status will be noted on the advising, official, and unofficial transcripts. The Academic Standing of a student is not specific or limited to ACC; it does impact a student’s enrollment at other CCCS colleges. Recognizing the value of measuring academic progress for all students, ACC (as a member of the Colorado Community College System) has established the following practice and procedures for measuring and notifying students of their academic standing. A student’s academic standing at one college may impact a student’s ability to register at another CCCS college. Students will be notified of their sacademic standing at their student email address only. Only college level classes will be used to calculate term and cumulative Grade Point Average (GPA); this does include summer term courses. Only courses taken “in residence” will be used for this procedure; “in residence” means taken at ACC. Courses taken elsewhere and transferred in do not apply. The GPA calculations for this procedure may not match those used for financial aid purposes. Cumulative Grade Point Average will be abbreviated as CGPA. Term Grade Point Average will be abbreviated as TGPA. Student has attempted fewer than nine (9) cumulative credit hours with a CGPA => 2.00 for all classes attempted. Student has attempted fewer than nine (9) cumulative credit hours with a CGPA< 2.00 for all classes attempted. Student has attempted at least nine (9) cumulative credit hours and has a CGPA => 2.00 for all classes attempted. Student has attempted at least nine (9) cumulative credit hours and has a CGPA < 2.00 for all classes attempted. If a student on Academic Probation - Initial earns a TGPA of at least 2.00 for all classes attempted during the term, but fails to raise their CGPA to at least 2.00 for all classes attempted, the student will be allowed to attend the next term, but will be placed on Academic Probation - Continuing. If a student on Academic Probation (Initial or Continuing) earns a TGPA of less than 2.00 for all classes attempted, the student will be suspended and will not be allowed to enroll at any CCCS college for the next term. Any student placed on academic suspension will be dropped from all courses in which they are enrolled for future semester(s). Initial Suspension is for one term, excluding summer. Second Suspension is for two terms, excluding summer. Third Suspension is for two full years, or four academic terms, excluding summers. If you are on academic suspension you must petition for re-entry, after sitting out your suspension period (as described above) by meeting with an Academic Advisor and submitting an Academic Suspension Petition for Re-Entry Form (available online at www.arapahoe.edu/admissions/forms) to the Academic Advising office prior to the start of the term for which you want to return. The Director will review your appeal and make a final decision to approve or deny. If your appeal is approved, your Academic Standing will be updated to Academic Probation - Continuing. If you have unusual circumstances of a compelling nature, you may appeal your academic suspension by submitting an Academic Suspension Appeal Form (available online at www.arapahoe.edu/admissions/forms) to the Director of Advising and Retention by the appeal deadline listed in your academic suspension notification letter. You must meet with an Academic Advisor to complete the Academic Suspension Appeal Form prior to submitting it to the Director, who will review your appeal and make a final decision (denial or approval). If your appeal is approved, your Academic Standing will be updated to Probation - Continuing status. Students may appeal their Academic Suspension at ACC and one other CCCS institution you may want to attend. It is the student’s responsibility to ensure accuracy of their schedule. This includes meeting all registration dates and deadlines. All students register online via myACC or Navigate. The Census Date, also referred to as the Add/Drop Date, is the last day a student may register or drop a course. Some programs have a separate admissions process and students must be admitted into the program prior to course registration. View the program’s web page for more information. Students may drop or withdraw from courses; there are deadlines associated with each. It’s important for students to understand the financial impact of dropping or withdrawing from courses. Students must be registered by the course census date. We advise students to be registered before the first day of class; however students can register for a class up until 5 p.m. on the course census date as long as the student has attended the class. Courses in certain programs and CCCOnline courses may have different registration deadlines. Online via myACC or Navigate through the first 7% of the course (typically the first week for 15- and 13-week courses). With a Schedule Adjustment Form after the first 7%, but prior to the census date. The completed Schedule Adjustment must be submitted to the Admissions and Records Office by 5pm on the course census date. An incomplete Schedule Adjustment will not be accepted; it must contain student information, faculty signature, and course information. No registration is permitted after the census date, regardless of prior course attendance or drop reason. Students must complete all course section changes by the course census date. * Courses in certain programs, and CCCOnline courses, may have different registration deadlines. **no registration is permitted after the census date, regardless of prior course attendance. Students must meet a course prerequisite before registering in a course. View the ACC course catalog for course prerequisite requirements. Students who took the prerequisite course at another institution need to provide an unofficial transcript to the Admissions and Records Office showing the prerequisite course completed with a C or better. Some courses require special permission from the Department Chair. In these cases, the Department Chair will grant the student permission to register in the course. Students registering in special permission courses must meet all registration deadlines. It is the student’s responsibility to drop a course by the census date. The census date, also referred to as the Add/Drop Date, is the last day a student may drop a course with a refund. Students will find the course census date on the Detailed Student Schedule (in myACC). Census dates are based total course length and not on the number of individual class meetings. When a student drops a course, they receive a full refund of tuition and fees for that dropped course, and the course no longer appears on the student’s academic record. Students drop courses via myACC on the Student Tab or via Navigate in the MyPlan section. If a student drops a course that is a prerequisite or co-requisite of another registered course(s), the student must drop all related courses. If a student receives financial aid or Veteran’s benefits, they should consult the Financial Aid Office or Veteran’s Affairs Office prior to dropping a course. Dropping a course(s) that results in reduced credit hours could have a negative effect on a student’s financial aid or Veteran’s benefits. Students cannot drop a course after the census date. If a student has extenuating circumstances that caused them to not be able to drop a course by the census date, the student may complete a Tuition Credit Appeal. Regardless of any of ACC Drop policies, it is ultimately the student’s responsibility to ensure the accuracy of their schedule and drop courses by the course census date. Students are expected to attend all classes. ACC conducts a drop for no show throughout each semester. Students who do not attend any class sessions by the course census (add/drop date), and are identified as a no show by the faculty, will be dropped from the course. Once dropped as a no show, a student cannot re-register in that same section, regardless of no-show reason. In addition, the student could be dropped from any prerequisite or co-requisite courses, regardless of attendance in the prerequisite/co-requisite course(s). Being dropped as a no-show can have negative consequences for students using financial aid or Veteran’s benefits. For online courses, attendance is defined as accessing the course and completing at least one academic activity (as determined by the individual faculty). Instructors will inform students of their individual attendance policies. Students are required to meet the prerequisite and/or corequisite requirement(s) for any course(s) in which they are enrolled. ACC regularly monitors student registration and if a student is found to not have met the prerequisite or corequisite (or received the appropriate override approval), they will be dropped from the appropriate course(s). Regardless of any of the ACC Drop policies, it is ultimately the student’s responsibility to ensure the accuracy of their schedule and add or drop courses by the appropriate deadline(s). Students may withdraw from a class after the Census Date and prior to the Withdrawal Deadline (which occurs at 80 percent of the class term); students may withdraw online by accessing myACC. Students may view the withdrawal deadline for their course(s) by accessing their Detailed Schedule available via myACC. Once withdrawn from a course, the student may not be re-registered back into the same section of that course during that semester. The class will still appear on the student’s transcript along with a “W” grade. However, a “W” will not affect the student’s credit or cumulative GPA. Students who do not officially withdraw by the deadline date will be graded by the Instructor. A “W” cannot be submitted by a faculty member as a final grade. If a student receives financial aid or Veteran’s benefits, they should consult with the Financial Aid Office or Veteran’s Affairs Office prior to withdrawing from a course. Withdrawing from a course results in reduced completion rate and could have a negative effect on the student’s aid. Students who do not officially withdraw from a course by the withdraw deadline will be graded by the faculty. Students cannot withdraw from a course after the withdrawal deadline. If a student has extenuating circumstances for not being able to withdraw from a course by the withdraw date, the student may complete an Administrative Withdrawal Petition. The College may initiate withdrawal in some instances. If a student withdraws from a course and has an unpaid balance, the student remains obligated to pay the outstanding balance. Unpaid balances are sent to collections and a collection fee is assessed. Students are expected to attend all classes. Instructors will inform you of their individual attendance policies. Please refer to the Drop for Non-Attendance for more information about how not attending a course could result in a student being dropped. Students may audit a course (i.e., take a course without earning academic credit), but they will be charged full tuition and fees (COF not applicable). Students can request to audit a course or change back to credit status through the census (add / drop) deadline of the course with Instructor permission. Audit students are expected to follow attendance and withdrawal policies and meet all program and course prerequisites and / or co-requisites. No credit is earned for courses taken by audit. Courses taken by audit are not eligible for the College Opportunity Fund, financial aid or veterans’ educational benefits. An audited course will not be considered to meet a future course pre-requisite. An audited course will not satisfy any degree or certificate requirements and will not count toward graduation requirements. To audit a course, a Course Audit Request must be submitted prior to the course census (add / drop) date; the form is available online at www.arapahoe.edu/admissions/forms. If a student believes they have a legitimate reason to do so, they may seek to have course(s) requirements in their declared degree or certificate program substituted. To pursue a Course Substitution, students must obtain a Course Substitution Petition from the Graduation & Prior Learning Assessment Coordinator. Substitutions must be approved by the Department Chair or Coordinator and appropriate Instructional Dean. Credit is not granted by a substitution; the petition must include how the credit requirement will be satisfied. No course substitutions are allowed in any of the Associate of Arts or Associate of Science Degrees, including the Degrees with Designation / Statewide Articulation Agreement degrees. Credit Completion Progress standards apply to all students who have attempted 9 or more credits at ACC, regardless of the number of term credits they attempt from that point forward. ACC will determine Credit Completion Progress standards following the posting of the majority of term grades for each semester. Students placed on Warning 1, Warning 2 or Warning 3 will be notified of their status (which may include notification via myACC). The Credit Completion Progress status of a student is specific to ACC and does not impact a student’s enrollment at other CCCS colleges. Credit Completion Progress: Will include all credit bearing classes (developmental and college level) will be used to calculate the percent of attempted credits passed. This includes summer term courses. Only courses taken “in residence” will be used for this calculation; “In residence” means taken at the student’s home institution. Courses taken elsewhere and transferred in do not apply. The credit completion rate for this procedure will not necessarily match those used for financial aid purposes or athletic eligibility. Grades considered to be passing when computing the percent of attempted credits passed are as follows: A, B, C, D, S/A, S/B, S/C, and S.
Grades considered to be failing when computing the percent of attempted credits passed are as follows: I, F, U/D, U/F, W, and AW. Course Completion Rate is calculated by dividing the total attempted credits by the number of credits successfully completed as per the definitions above. Student has attempted fewer than 9 cumulative credit hours will not be assessed for credit completion. Student has attempted at least 9 cumulative credit hours and has a cumulative course completion rate of at least 50%. Student has attempted at least 9 cumulative credit hours and has a cumulative course completion rate of less than 50% for the first time. Student has attempted at least 9 cumulative credit hours and has a cumulative course completion rate of less than 50% for the second time. If a student on Credit Completion Probation passes 50% or more of their attempted term credits, but fails to raise their cumulative completion rate to 50%, they will be allowed to continue the next term, but will remain on Credit Completion Probation. less than 50% for the third time. Students on Warning 1 will receive a communication regarding their credit completion status and will be given information on resources, best practices, etc. Students on Warning 2 will receive a communication regarding their credit completion status and will have a credit completion hold (which will impact registration) placed on their student account at ACC. The student will not be able to make any changes to their student account until they meet with an advisor. Students on Warning 3 will receive a communication regarding their credit completion status and will have a credit completion hold (which will impact registration) placed on their student account at ACC. The student will not be able to make any changes to their student account until they meet with an advisor. The college reserves the right to limit the number of credit hours that the student may take when a student is on Warning 3 status. Participation in formal courses and in-service training sponsored by associations, business, government and industry. There are costs associated with the various forms of PLA credit; students may refer to the Credit for Prior Learning / Prior Learning Assessment page on ACC’s website for current cost information. Students may use Prior Learning Assessment to fulfill all degree / certificate graduation requirements except for the mandatory residency requirements* (generally speaking, a minimum of 25% of the credit requirements for a degree or certificate must be completed in residence at ACC). PLA credit may only be awarded for courses and credits required in the student’s declared degree or certificate. Students may earn college credit through certain standardized testing. Upon receiving a satisfactory score, students may earn college credit. A current detailed list of tests and acceptable scores is maintained on the ACC Prior Learning Assessment webpage. For more information on what types of exams Arapahoe Community College accepts, please contact the ACC Graduation & Prior Learning Assessment Coordinator at 303.797.5630. To schedule a CLEP, DSST, UExcel exam and/or for fee information, please contact the ACC Testing Center at 303.797.5993. If a student has taken one of the standardized exams listed below at another location, they may order an official transcript/score report and have it sent to ACC for evaluation: Arapahoe Community College, Attention Admissions and Records, Campus Box 14, 5900 S. Santa Fe Drive, P.O. Box 9002, Littleton, CO 80160. CLEP (The College-Level Examination Program) gives students of any age the chance to demonstrate college-level achievement through a program of exams in undergraduate college courses. 2,900 colleges grant credit and/or advanced standing for CLEP exams. DSST exams are available in a variety of subjects. Previously just available to those in the military, since 2006 DSST exams are available to adult learners, homeschooled students and military veterans as a way to earn college credits. Uexcel exams are offered in a variety of subjects and provide students the opportunity to earn college credit by exam. AP exams are generally taken as a final part of the AP course the student is completing while in high school. IB exams are taken at the end of a student’s participation an IB program at their high school. Institutional Challenge Exams are faculty-developed tests. They assess a student’s mastery of the competencies for the ACC course being taught. For more information on Institutional Challenge Exams, please contact the ACC Graduation & Prior Learning Assessment Coordinator at 303.797.5630. Institutional Challenge Exams are the way ACC abides by Colorado Revised Statutes 23-1-125, which requires public institutions of higher education to offer students an option for testing out of core courses. Published guides contain credit recommendations made by reputable third party organizations for certain trainings and / or credentials. Approved published guides include the American Council on Education (ACE), National Guide to College Credit for Workplace Training, the ACE Military Guide, and the National College Credit Recommendation Service (NCCRS). Additionally, credit for learning gained in the U.S. military (if applicable to a student’s declared degree or certificate at ACC) is generally transferred based upon ACE credit recommendations found on a Joint Service Transcript (JST) for current or former Army, Coast Guard, Marine Corps, or Navy personnel. Air Force personnel will have their credit documented on a Community College of the Air Force (CCAF) transcript. To be evaluated for possible credit, you should order your official transcript from the provider (JST, CCAF) or third party organization (ACE, NCCRS, etc.) and have it sent directly from the issuing organization to ACC for evaluation: Arapahoe Community College, Attention Admissions and Records, Campus Box 14, 5900 S. Santa Fe Drive, P.O. Box 9002, Littleton, CO 80160. Knowledge and skills acquired through work and lifelong learning may be evaluated and validated through a formal portfolio assessment process. 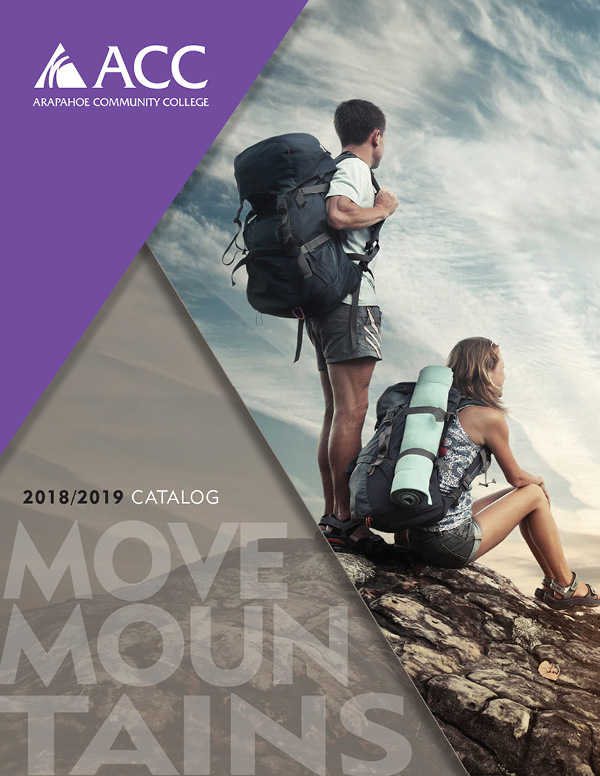 For more information on Portfolio Assessment at Arapahoe Community College accepts, please contact the ACC Graduation & Prior Learning Assessment Coordinator at 303.797.5630. ACC may evaluate non-collegiate instructional programs that result in industry certification, professional licensure, apprenticeship completion, and other workplace skills development. Faculty subject-matter experts will evaluate the prior learning and identify if the learning warrants the awarding of credit. For more information regarding this type of prior learning assessment at Arapahoe Community College accepts, please contact the ACC Graduation & Prior Learning Assessment Coordinator at 303.797.5630. If you find omissions or errors in your grade report, ask the Admissions and Records Office to review the record. If you find a computational error or you wish to have an I (Incomplete) converted to a letter grade, notify your Instructor of the appropriate department. All requests to review errors must be filed within one year from the end of the course; requests made after one year will not be considered. Grade points indicate the achievement for the number of credits completed. To calculate a grade point average, multiply the course credits by the grade points for the grade earned. Total the course credits and total the grade points. Divide the total grade points by the total course credits. The result is your GPA. Only the credits and grade points you earn at ACC will be used to compute the semester and cumulative GPA appearing on your ACC transcript. Grades awarded for developmental courses (courses numbered under 100) will not be included in a student’s grade point average. Grading for developmental courses will utilize the Developmental grade mode (S/A, S/B, S/C, U/D, U/F). The credits will count toward earned and attempted credits. GPA’s for term recognition such as President’s List and Dean’s List will not include developmental courses in the calculation. Grades will be available to students after grades are posted at the end of each semester. Students may access their grades online at www.arapahoe.edu by accessing myACC. If a student is eligible to receive veteran educational benefits, they must make sufficient academic progress to retain their full educational benefits. Their cumulative GPA will be computed by their A, B, C, D, F and S grades. Grades of “I” or “U” are reported to the VA Regional Office as non-punitive grades. The VA may deny some of a student’s benefits for the semester they received an “I” or “U” grade, unless those grades are corrected by the end of the next regular semester. Under “mitigating circumstances,” a student may appeal this decision. Grades of “W” are also reported to the VA Office and include the date of withdrawal. Once again, a student may be denied some of their benefits, unless their mitigating circumstances are accepted by the VA. VA students must earn at least a 2.0 GPA each semester or risk being placed on probation. Those who do not improve their grades by the end of the next semester may be subject to suspension of their benefits. If a student’s benefits are suspended, they may reinstate them by 1) undertaking academic progress counseling with Advising, or 2) completing a semester of credit hours equal to or greater than the hours they were taking in the semester their benefits were terminated. The VA will certify payment if the student’s cumulative GPA for the semester is 2.0 or above. Veterans are not awarded benefits for courses assigned an “AU” (Audit) designation or for credit awarded through prior learning (i.e. portfolio, challenge, etc.). Students are responsible for keeping the Veteran Services Coordinator (Room M1605) informed of any changes in their enrollment status, address and/or phone number while attending ACC. Students must make sure that the classes they are registered for apply toward their degree. Failure to do so may affect payment of the student’s monthly benefits. The Admissions and Records Office keeps a permanent academic record of a student’s college progress. We use a grading system to evaluate the level of a student’s academic achievement. The following grades are awarded for each course and entered on a student’s academic record. The student has demonstrated superior mastery of achievement of course objectives. The student has demonstrated better-than-acceptable mastery of the course objectives and/or additional objectives. The student has demonstrated acceptable mastery or achievement of the course objectives. The student remained enrolled in the course but has not demonstrated achievement of course objectives. An incomplete may be given to students who, because of illness or circumstances beyond their control, are unable to complete their coursework within the semester. An Incomplete is given only if the student has completed at least 75% of the term with a “C” or better and has provided evidence to the Instructor that they are unable to continue. A faculty member enters the Incomplete online, along with the incomplete final grade and extension date. The student can view the assigned Incomplete Final Grade and Extension Date on the unofficial transcript, available via myACC. Incomplete Final Grade is the grade the student will earn if they submit no additional work. Extension Date is the maximum amount of time that a student has to complete the course requirements (not to exceed the end of the semester following the one in which the Incomplete was earned). Work that the student must submit to complete the course. The grade to be assigned if the work is not completed. The grade assigned by the Instructor will be posted on the transcript and the “I” removed if the work is not completed in the time period established on the form. To remove an Incomplete and have it replaced with a grade, following the successful completion of the course requirements; the faculty must submit a Grade Change form to the Admissions & Records Office. Some students prefer to “audit” a course for self-enrichment or review without earning a grade or college credit. You can request to audit by submitting the Course Audit Request Form to Admissions & Records by the census (add / drop) date for the course. Courses taken by audit are not eligible for the College Opportunity Fund, financial aid or veterans’ educational benefits. Audited courses do not meet course pre-requisite or graduation requirements. College administration withdrew the student from these courses, or approved an Administrative Withdrawal Petition or Tuition Credit Appeal. These courses are not calculated in hours completed or GPA, but are counted in completion rate calculations. Students may withdraw from a class after the Census Date and prior to the Withdrawal Deadline (which occurs at 80 percent of the class term); students may withdraw online by accessing myACC. Students may view the withdrawal deadline for their course(s) by accessing their Detailed Schedule available via myACC. Once withdrawn from a course, the student may not be re-registered back into the same section of that course during that semester. The class will still appear on the student’s transcript along with a “W” grade. A “W” will not affect the student’s cumulative GPA but will negatively affect a student’s completion rate. Students who do not officially withdraw by the deadline date will be graded by the Instructor. A “W” cannot be submitted by a faculty member as a final grade. The College may initiate withdrawal in some instances. If a student withdraws from a course and has an unpaid balance, the student remains obligated to pay the outstanding balance. Unpaid balances are sent to collections and a collection fee is assessed. “IP” will appear on the transcript while a course is in-progress and before a final grade is posted. A student may utilize DegreeCheck, available via myACC, to monitor progress toward earning their degree or certificate; students can informally check on their degree/certificate through the Office of Advising. ACC may choose to confer degrees and certificates for students whom we have identified as having completed all program requirements; however, this automatic conferral is not guaranteed and each student is ultimately responsible for applying for graduation. Catalog may not be more than six academic years old at the time of graduation. Programs that are selective admission or pre-professional may have more restrictive catalog year requirements and may limit the catalogs from which a student may choose for graduation requirements. Unless otherwise stated by the Department Chair, students must go by the requirements listed in the catalog for the academic year in which they were officially accepted in the degree / certificate program. Achieve a cumulative grade point average of 2.0 or better in coursework applicable to the degree or certificate. Some programs also have minimum “C” grade requirements for certain courses or all courses in that degree and / or certificate program. Fulfill the published course and program requirements applicable to their degree or certificate. If they are using a Catalog for their graduation requirements that was in effect before their 35th birthday, they must satisfy the physical education requirement (if this requirement is to be substituted, the student must complete the appropriate credit to substitute for physical education). Complete a minimum of 25% of credit hours required for the degree at ACC*. *Certain degree and certificate programs may have more restrictive residency and / or transfer credit requirements. If a student wishes to enroll in additional courses at ACC after they graduate from their declared program of study, they will need to declare a new program. It is possible to earn multiple degrees at ACC; for detailed information about the rules and requirements to earn multiple degrees please contact the ACC Graduation & Prior Learning Assessment Coordinator. Content in a course may change as new information or technology becomes available. Some changes are so critical that dated courses may no longer satisfy current requirements for the degree or certificate. Courses taken within the six year Catalog limit will not be subject to this review unless otherwise specified in the Catalog by the department. When you complete your degree and/or certificate requirements, you may receive your diploma(s) in the semester in which you satisfy the requirements, provided you complete the graduation application process below. View your DegreeCheck program audit available online via myACC to ensure all requirements are completed or in progress. Complete and submit a Graduation Application online at www.arapahoe.edu/graduation. Verify your address on file with ACC by logging into myACC or by calling the Admissions and Records Office at 303.797.5621. Expect an e-mail, sent to your student e-mail account, from the Graduation & Prior Learning Assessment Coordinator officially informing you of your remaining requirements. Initiate any Course Substitution Petitions. If qualified and interested, join Phi Theta Kappa Honor Society. Students are encouraged to participate in the annual Commencement ceremony held each May. Students should indicate their interest in participating in the Commencement Ceremony on the Graduation Application. ACC graduation and commencement are two separate events. Graduation is the actual conferral of degrees/certificates and the mailing of diplomas. Commencement is the ceremony that celebrates the student’s completion of the degree and / or certificate. Update your contact information (mail, email, telephone) with the ACC if necessary. Summer, Fall and Spring semester graduating students who indicated on their graduation application that they were interested in participating in the commencement ceremony, should expect to receive detailed ceremony information at their student e-mail address by the second week of March. If you do not receive information by the third week of March, contact the Dean of Students Office at acc.dos@arapahoe.edu or 303.797.5730. The annual commencement ceremony is held at a local venue, which will be announced on the ACC Commencement Ceremony website. The ceremony date is listed on the Academic Calendar, which is available at www.arapahoe.edu. Purchase your cap, gown and tassel for the ceremony from the Bookstore on the date(s) published in the ceremony information packet. Expect to receive additional information at your student e-mail address by the end of April with instructions for the day of the ceremony. If you do not receive an e-mail, contact the Dean of Students Office at acc.dos@arapahoe.edu or 303.797.5730. Expect to receive a proof of your graduation photo and order form from the photographer so you may place an order. If you do not receive this after six weeks, and you want to see your photo, contact the photographer listed in your information packet. Graduation honors recognize outstanding academic achievement throughout a student’s academic career at the home institution. The honors are awarded to students who complete the requirements for an Associate Degree and earn a 3.5 or better cumulative grade point average at the institution. Only college level courses completed at the institution will be included in the GPA calculation. Students must earn 30 degree-applicable credit hours in residence at ACC to be eligible for graduation honors. The three levels of recognition are defined as follows and will be posted on the student’s transcript. Students will be limited in the number of times that they can take the same course; however, certain courses are exempt from the repeat course procedure due to the nature/offering of the course. If a student has taken a course twice or more and attempts to register for the course an additional time, the student will not be able to register for that particular course until an action plan is created and approval granted by the Director of Advising. Please note that the student is able to register for other courses without needing an action plan or approval as per college rules and regulations. If the Director of Advising does not feel that the registration is warranted, the student may appeal via the Repeat Course appeal policy. If you complete the repeat of a course after June 1, 1987 and before August 27, 2006, you can request that the original course and grade have a notation under the course title which reads “Repeat (excluded from GPA).” If you do not make this request, all instances of the course will remain on the transcript and be calculated into the GPA. For graduation purposes, a course will only count once within any single degree or certificate program and will be “flagged” as repeated during the degree check process. If you repeat a course beginning Fall semester, 2006, the highest grade will be used in the GPA calculation. There will be no limitations on course grades that are eligible to repeat. All credit hours earned for initial and repeated courses will be deducted from students remaining College Opportunity Fund Stipend eligible hours. Repeated courses may be applied only one time to a certificate or degree, except for variable credit courses and other designated courses, such as Special topics. Make your request to have the previous instance of a course flagged as a repeat by submitting the Repeat / Exclude from GPA form, available online at www.arapahoe.edu/admissions/forms. A quality general education experience that develops competencies in reading, writing, mathematics, technology and critical thinking through an integrated arts and science experience. Students should be able to complete their Associate of Arts or Associate of Science degree programs in no more than sixty credit hours or their baccalaureate programs in no more than one hundred twenty credit hours, unless there are additional degree requirements recognized by the commission. A student can sign a two-year or four-year graduation agreement that formalizes a plan for that student to obtain a degree in two or four years, unless there are additional degree requirements recognized by the commission. Students have a right to clear and concise information concerning which courses must be completed successfully to complete their degrees. Students have a right to know which courses are transferable among the state public two- and four-year institutions of higher education. Students, upon successful completion of core general education courses, should have those courses satisfy the core course requirements of all Colorado public institutions of higher education. Students have a right to know if courses from one or more public higher education institutions satisfy the student’s graduation requirements. A student’s credit for the completion of the core requirements and core courses shall not expire for ten years from the date of initial enrollment and shall be transferable. Through its procedures, Arapahoe Community College (ACC) ensures the rights of all its students to pursue their educational objectives. The ACC community includes students who are enrolled in ACC courses for credit or non-credit courses, including Community Education courses. The ACC community also includes faculty, staff, administrators and guests. A student is subject to two sources of authority: College authority and civil-criminal authority. ACC also expects students who are enrolled in specialized programs to follow the standards specified in their respective program handbooks (e.g., Nursing, Law Enforcement Academy and Emergency Medical Technician). Judicial processes, including code of conduct, academic honesty statement and grievance procedures are stated in the ACC Student Handbook. The Handbook is available in the Student Engagement Center, Room M2720 or at https://www.arapahoe.edu/campus-life/student-handbook. For answers to specific questions, contact the Director of Student Life.